Notes: December 1997 - A clean bole with a single gash reveaing this to be a thin skinned hollow tree. Records show the gap has been closing. It will eventually disappear altogether and the completely hollow tree will appear solid. 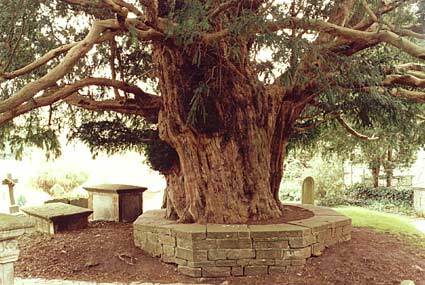 A revisit in October 2006 found the yew to be still in excellent condition. Latest information: 1st Sept 2014 Peter Norton: The male yew grows east of the south facing porch. Its lower bole is enclosed within an ornamental wall which has started to crack as the tree expands. Fine healthy foliage and minimal sensitive pruning indicates great care is taken of this yew. There is also a small area of pale epicormic growth coming out of a burr on the west side of the tree. Votive offerings were evident with apples, red/blackcurrents and plums placed in small crevices, while inside the tree written messages and shells could be seen. A few ribbons had been tied to the lower branches. High in the crown, what looks like nylon webbing was bracing at least four main branches. The tree is hollow and older generations have informed people that they can remember climbing inside, though this is no longer possible.Girths were recorded from the top of the soil on the side nearest the south path as follows: 23' 9'' at 1'; 23' 4'' at 1' 8''; 23' 5'' at 2'.